Paul Eschholz and Alfred Rosa are professors emeriti of English at the University of Vermont. They have directed statewide writing programs and conducted numerous workshops throughout the country on writing and the teaching of writing. Eschholz and Rosa have collaborated on a number of best-selling texts for Bedford/St. 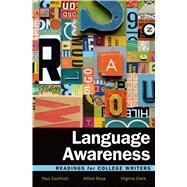 Martin's, including Subject & Strategy; Outlooks and Insights: A Reader for College Writers; with Virginia Clark, Language Awareness; and, with Virginia Clark and Beth Simon, Language: Readings in Language. James Baldwin, If Black English Isn’t a Language, then Tell Me, What Is? *Sharon Marcus, Are Catcalls Free Speech? How Is Language Involved in Lies, Slander, and Fraud?